Ctrax is an open-source, freely available, machine vision program for estimating the positions and orientations of many walking flies, maintaining their individual identities over long periods of time. It was designed to allow high-throughput, quantitative analysis of behavior in freely moving flies. Community Core Vision: Built with computer vision and machine sensing in mind, they mention multi touch applications as one of their focus on the website. 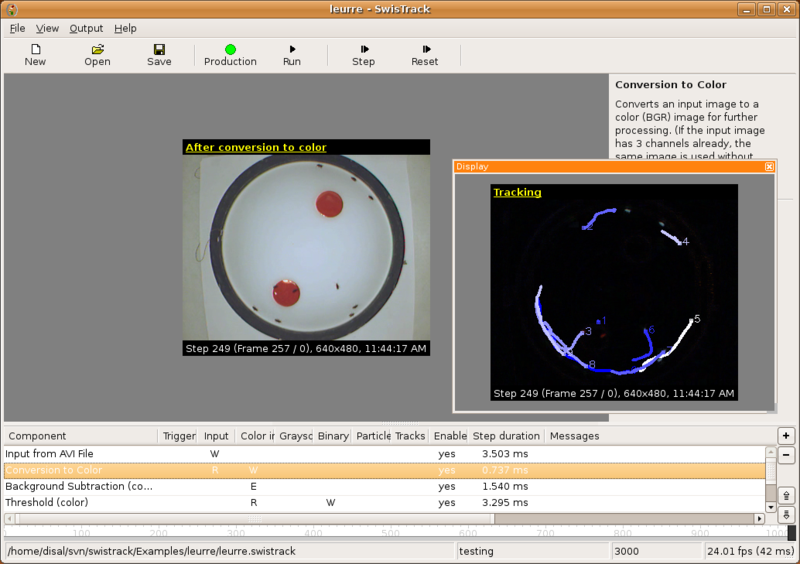 Tracking-Learning-Detection: Developed by Zdenek Kalal this software intends to track pretty much anything (object determination can be done via mouse) in real time and to learn features from the object as tracking goes on. Tracking software for Drosophila, by Colomb et al. Open CV is a library for machine learning and computer vision. It is written for different computer languages and different operational systems. The library has more than 2500 optimized algorithms, which includes a comprehensive set of both classic and state-of-the-art computer vision and machine learning algorithms. These algorithms can be used to detect and recognize faces, identify objects, classify human actions in videos, track camera movements, track moving objects, extract 3D models of objects, produce 3D point clouds from stereo cameras, stitch images together to produce a high resolution image of an entire scene, find similar images from an image database, remove red eyes from images taken using flash, follow eye movements, recognize scenery and establish markers to overlay it with augmented reality, etc. Simple CV is a framework that tries to simplify the development of software that require computer vision/machine learning, since a lot of researchers have the necessity of building on such concepts, but sometimes don’t have the time/training necessary to do so.